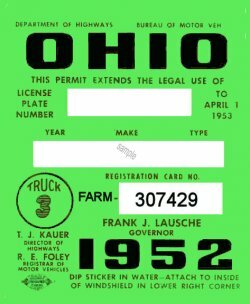 1952 Ohio Farm Truck regitration/inspection - $20.00 : Bob Hoyts Classic Inspection Stickers, Add a Final Touch to your Restoration! This amazing 1952 Ohio Farm Truck sticker is completely different from any other Ohio sticker. This sticker was issued to Ohio farm trucks. Ohio never had a statewide inspection program before 1966. In 1966 Ohio began inspections that continued to at least 1991. Ohio did have a spot check program in many areas and car dealers issued the safety check stickers as far back as 1946. For an additional $10.00 we can add all the information of your truck, Year/Make/model and license plate number.